Almost all our summer crops are in the ground. Tomatoes, peppers, melons, greens, zucchini, cucumbers, sweet corn, etc; they are all planted and growing. We still have winter squash and pumpkins to transplant this week. After that we move on to seeding fall crops like cauliflower and sweet potatoes. Soon we’ll spend most of our time harvesting and weeding. This moment is an annual milestone for Steve. He really hustles to get the farm ready with tilled cover crops, compost and final tillage to smooth the fields. This week, he stayed one step ahead of the crew, preparing beds just ahead of the transplant crew. Steve spreads composted chicken manure to prepare the next melon field. You can see straw-like cover crop residue which has been chopped and incorporated into the soil, and beginning to decay. The cover crops feeds our soil microbes and release nitrogen as they decompose. The chicken compost provides nutrients before the cover crops decay. This photo shows our next field of lettuce, scallions and cabbage but it also the tapestry of the farm, a mix of planted fields, green crops and tan chopped cover crops. The colors are beautiful right now! At top, Steve checks the same lettuce and scallion field late in the day. At bottom, gorgeous red chard glows in the sun. We all enjoyed the cooler weather this week. It’s make our lives much more pleasant. Above, all hands on deck for the arugula harvest. We picked the first zucchini for you this week. The plants are healthy and bursting with sap. Look how much juice emerged immediately after cutting. Members asked this week how to remove grit from greens like lettuce and spinach. Here’s our approach. It works. 1. We have one kitchen sink so we use a 4 gallon Rubbermaid basin. Fill halfway with cold tap water. If you have two sinks, fill one sink partway with cold water. 2. Chop your lettuce or spinach to the size you wish. 3. Dump it into the water and swish around gently but thoroughly. 4. Working in two batches (for average lettuce head) or more batches (big spinach bunches, Romaine), pull handfuls out of the water and drain in the basket of a salad spinner. 5. After all the greens have been rinsed one time, dump the water. Rinse the basin and refill with cold tap water. 7. Spin your greens dry and store in a dry container. They store much better when spun dry. – By pre-chopping the greens, you free soil trapped in the head. – You are using a large amount of water to wash and dilute away the grit. – By pulling the greens out of the water, you take advantage of the draining action to pull the grit with it. 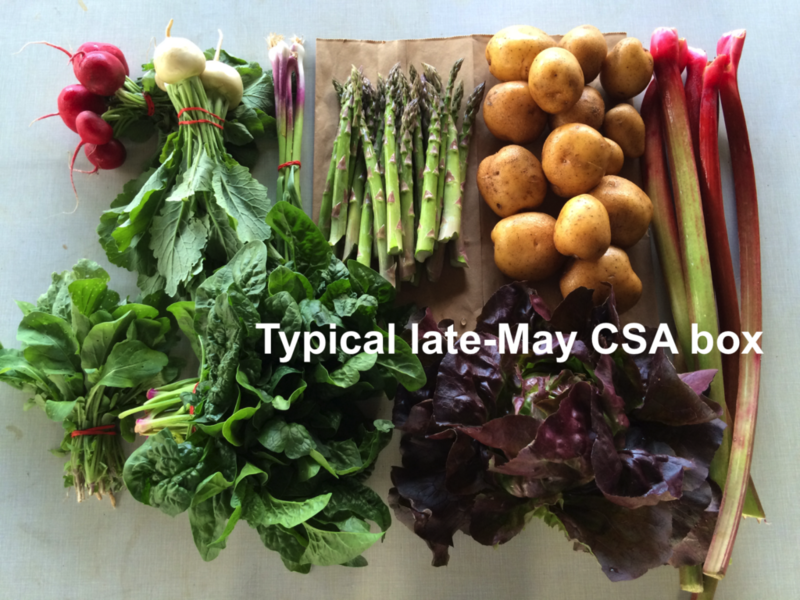 Next week’s box will probably contain kale, lettuce, zucchini, scallions and more. Tipi tomato juice – We had this juice bottled from our tomatoes last summer. It’s a great way to capture ripe tomatoes at peak season, at a moment when we are swimming in tomatoes. Drink it or try making an easy soup. Simmer diced zucchini in the juice. Add spinach, minced scallions and green garlic near the end of cooking. Voila! Soup! Romaine lettuce – It’s a robust head of lettuce this week! We plan to make lettuce wraps and Caesar Salad this week. Asparagus – This is the final asparagus. It was a short season but we need to let the plants regrow and replenish their root reserves for next year. We had trouble with weeding last year and it showed up in this year’s small harvests. The hot spell did not help. We’ll coddle the plants well this summer. Zucchini & summer squash – The first picking! Shiitake mushrooms – These are from Hidden Valley Mushrooms, the same people who grew last week’s button mushrooms. Most years, we buy portobellos for this box but decided to try the shiitakes instead because I think they will combine well with the spinach and green garlic. These must be cooked. A small subset of people can have a toxic reaction to raw or undercooked shiitakes. Once cooked, they are harmless. And tasty! Storage: Refrigerate in a paper bag. These are perishable so use soon. Lightly sauce in butter and add to any dishes. I used mine this week in a a frittata (favorite Smitten Kitchen recipe below), as well as sauteed and mixed into pasta salad. Sauteed shiitakes and spinach are a great toppings for rice bowls, e.g. 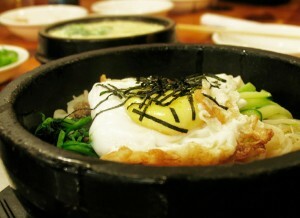 bibimbap. Arugula – This arugula is very spicy, a legacy of the recent hot weather. I suggest that you add it to other dishes in small amounts, either raw or cooked. That helps dilute the heat but you still get the arugula flavor. Green garlic (left) and scallions (right) look so much alike! Distinguish them this week by whether the leaves are trimmed (green garlic) or untrimmed (scallions). They smell very different too. However, it’s not a crime if you interchange them in recipes. The green garlic leaves are increasingly fibrous; use just the white and pale green sections. You can use scallions all the way to the tips. You will get just two green garlic stalks this week and they probably be loose not bundled. Smitten Kitchen has a terrific, easily adapted frittata recipe. The egg to milk ratio and the cooking times are perfect. I’ve made the recipe several times, starting with frozen roasted peppers and early spinach, then moving on to asparagus, spinach, mushrooms and green garlic. I tried shaving the asparagus (as in the recipe) but find it easier to just save a handful of cooked asparagus to use with this recipe. Sautee the mushrooms in the pan, remove, then proceed to the recipe. This first step is my fool-proof method for making quinoa (learned from I am a Food Blog). If you have your own tried and true method, feel free to do that instead and ignore this first step. Rinse your quinoa is a fine-mesh strainer. Add to a medium saucepan and toast over medium heat for 1-2 minutes until fragrant but way before it begins to burn. Add broth and bring to a boil. Reduce to a simmer, cover and cook for 15 minutes. Once the timer goes off, turn off the heat but leave the pan on the burner and leave the cover on for 5 minutes more. This dish is just screaming to be served next to a nice juicy cut of steak or something else delicious just off the grill. It is cold and refreshing with just enough spice and bite. It’s also incredibly simple and even simpler if you have a mandolin (which makes for very easy slicing) and coming together in 10 minutes flat. Lauren. In a large bowl combine sliced radishes, turnips and scallions together. In a small bowl, combine yogurt, oil, lemon juice, salt and pepper. Whisk until smooth and yogurt has thinned a bit. ***If you don’t plan to eat this all at once, just toss enough dressing to coat the veggies you plan to eat tonight. This doesn’t store well as the dressing gets a little runny. I store the veggies and dressing separately in my fridge if there are leftovers.